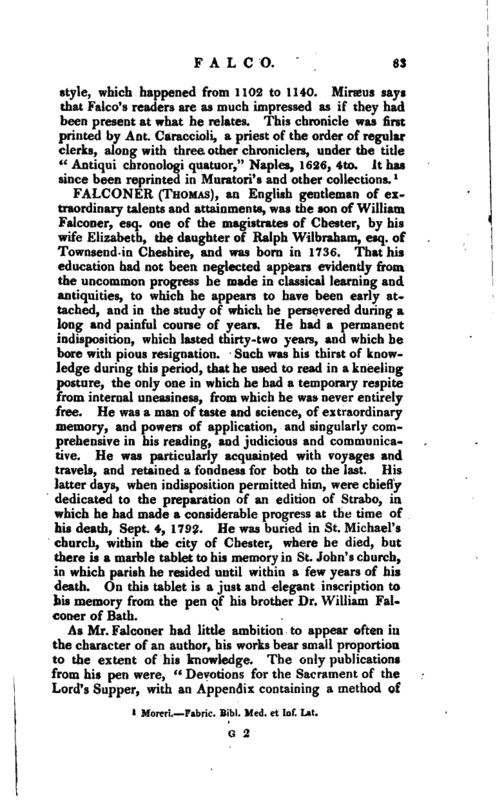 , an English gentleman of extraordinary talents and attainments, was the son of William Falconer, esq. one of the magistrates of Chester, by his wife Elizabeth, the daughter of Ralph Wilbraham, esq. of Townsend in Cheshire, and was born in 1736. That his education had not been neglected appears evidently from the uncommon progress he made in classical learning and antiquities, to which he appears to have been early attached, and in the study of which he persevered during a long and painful course of years. He had a permanent indisposition, which lasted thirty-two years, and which he bore with pious resignation. Such was his thirst of knowledge during this period, that he used to read in a kneeling posture, the only one in which he had a temporary respite from internal uneasiness, from which he was never entirely free. He was a man of taste and science, of extraordinary memory, and pqwers of application, and singularly comprehensive in his reading, and judicious and communicative. He was particularly acquainted with voyages and travels, and retained a fondness for both to the last. His latter days, when indisposition permitted him, were chiefly dedicated to the preparation of an edition of Strabo, in which he had made a considerable progress at the time of his death, Sept. 4, 1792. He was buried in St. Michael’s church, within the city of Chester, where he died, but there is a marble tablet to his memory in St. John’s church, in which parish he resided until within a few years of his death. On this tablet is a just and elegant inscription to his memory from the pen of his brother Dr. William Falconer of Bath. 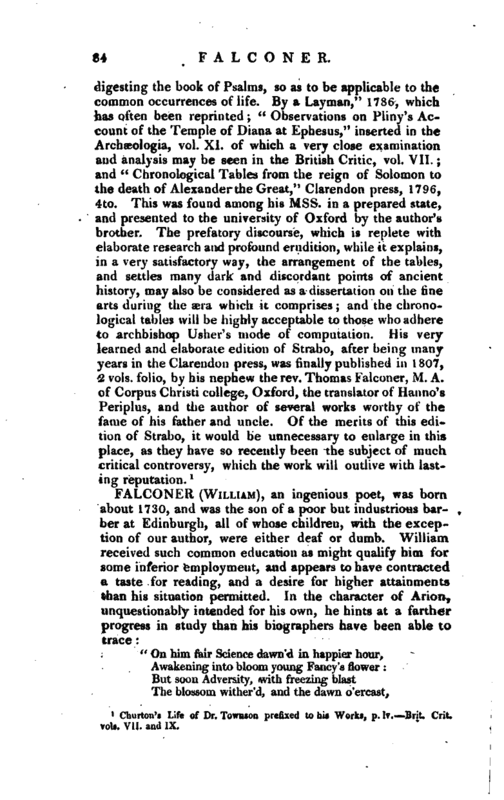 Churton’s Life of Dr. Towason prefixed to hi* Works, p. Iv. Brit. Grit vols. VII. and IX.